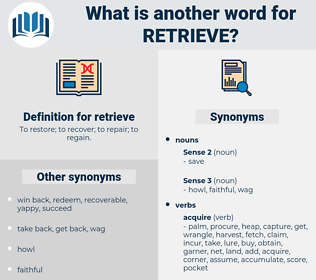 What is another word for retrieve? To restore; to recover; to repair; to regain. recoverable, fetch, recapture, reclaim, recall. 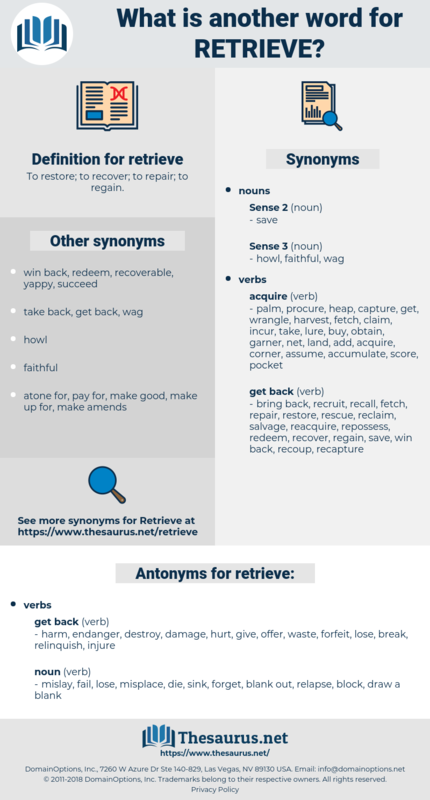 fetch, recapture, retrieval, reclaim, recall. retreive, recuperate, revive, re-establish, repossess, rediscover, retake, rebuild, reacquire, rehabilitate, reinstate, revert, retrive, locate, found, regenerate, acquire, catch, withdraw, resume, identify, gather, capture, restart, rescue, save, saving, recapture, extricate, grab, scavenge, achieve, recycle, trace, renew, search, seek, seize, reclaim, bring, earn, secure, retract, produce, retrace, rejoin, eject, consult, access, recall, draw, detect, garner, retire. harm, endanger, destroy, damage, hurt, give, offer, waste, forfeit, lose, break, relinquish, injure. draw a blank, fail, blank out, block, forget, misplace, sink, relapse, die, mislay. If That has been encouragement, I deserve censure; but I meant it to retrieve him. Were he able to retrieve the past three months the mystery of Lady Dyke's death would have remained a mystery forever.